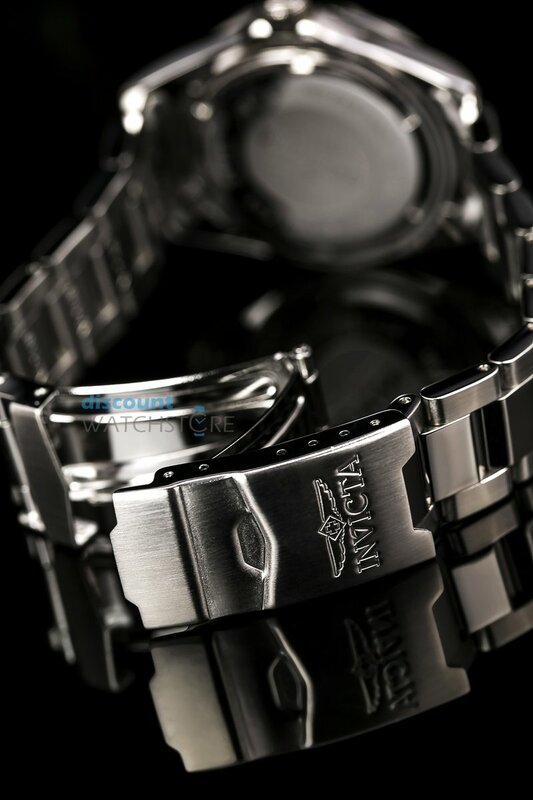 The Invicta 8932 Pro Diver Collection Silver-Tone Watch is described as an affordable timepiece, with high end build quality. Swiss movements automatically support this boldest of statements. Is it possible therefore to get the quality you desire at a price that you are more than prepared to pay? Can you get a high end timepiece without a price tag to match? We have to remember that individuals no longer have only one watch. The have occasion watches, for dress, for show, and for impact as well as for simply timekeeping, so who will wear the 8932? The 8932 is a large timepiece, silver colored strap, with a black face and unidirectional black bezel. 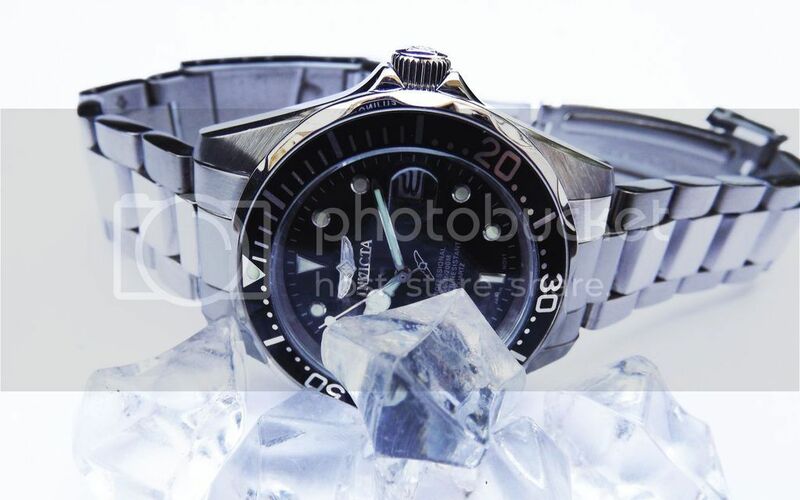 It is water resistant to 200m which is good given that it is part of the Diver range. It holds a presence and impact value from the size, but that may also be a detraction as much as it is a strength. You have to have the matching personality to back up an “impact watch”, i.e. I do not think it is one for the shy and retiring gentleman, anything but, it is less a timepiece, more a presence. We have a “cheap” watch with the benefit of Swiss components. The watch has simple trim and bezel to match the face. The 8932 build materials are well made and feel so. Having a Swiss-made components will mean that you will be able to tell the time, and surely this is the major purpose of a watch. Also, you could take advantage of the “diver” element and plunge to depths around 200m. The brand states affordable luxury. But what may be lacking is that little extra. With the 0072 there is the “gold” factor. Here it is simple silver and black so what is it that is making this watch something out of the ordinary, many will not be able to see what this is. Swiss components mean quality but the rest is for the individual to find. Some may not find it. Yes, it is big and bold, but then what? It doesn’t have chronographs like the 6620, just the date at 3 pm, nor does it have the viewing back where the internal movements can be viewed as in 89260B though this is a strange feature only good for when the watch is taken off. 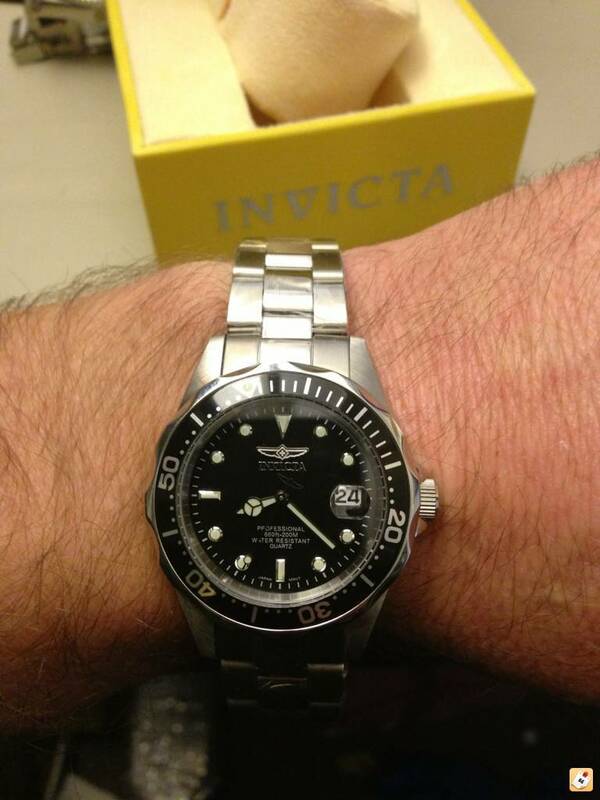 Personally, I like the black face, and bezel, it is cold, clinical, but that is an opinion not a fact. Compare the 6620 which has a silver strap, silver face, silver bezel, and as much as I like silver, this may be a bit too much uniformity. Over the years, fashions change with the wind. However, quality, workmanship and true style are timeless, if you forgive the pun. I love silver, I would always choose a silver watch over a gold watch, but maybe that is reflective of my own personality as much as my style. I find golden watches, like the Invicta Men’s 0072 too much. They invite comments, whereas the 8932 simply exists and serves a purpose. Ferraris are red for a reason, and Aston Martins are driven by James Bond, so the 8932 is the equivalent of the Aston. 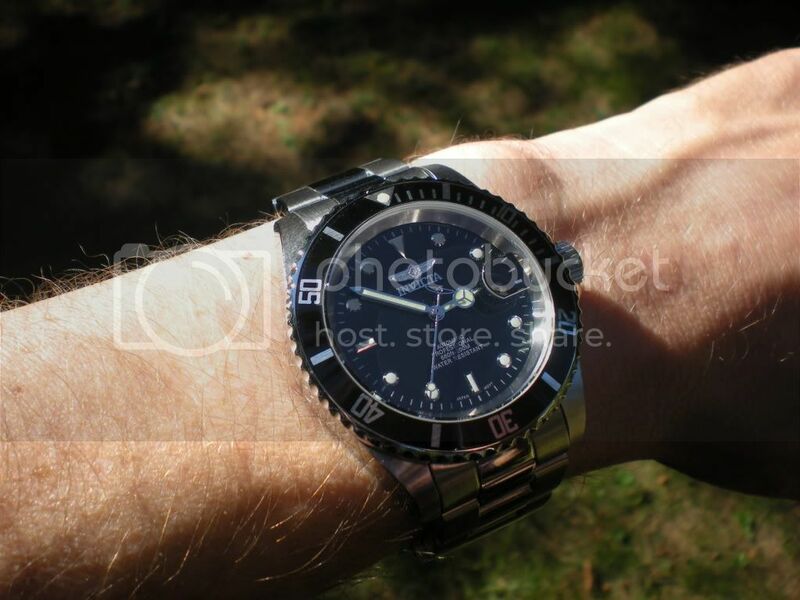 Personally, I like the black face, and bezel, it is cold, clinical, but that is an opinion not a fact. Compare the 6620 which has a silver strap, silver face, silver bezel, and as much as I like silver, this may be a bit too much uniformity. The price is phenomenal when taking into account Swiss components. Is it fashionable, ask a fashionista. I do however consider it cheap, without looking cheap, a trick that many others have not managed. If you know watches, you may turn your nose up, but should you care, no. You’ll have a handsome watch of some distinction that can easily turn an eye and can certainly turn a conversation. On review the watch is described as big, bold and masculine. It is a round faced gentleman’s watch with a simple unidirectional bezel. The hands are luminous aiding night time reading and the date can be found at 3 pm. 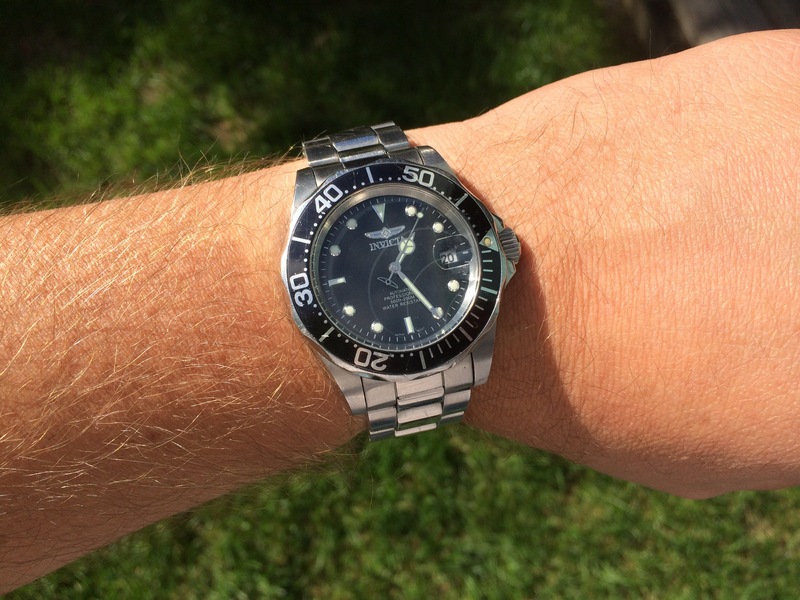 Swiss made components and benefits from a diver fastening stainless steel bracelet/strap. It is waterproof to 200m or 660ft. Although there is a real presence in its size, it is in fact slightly smaller than 89260B, which let’s face facts must have be massive. 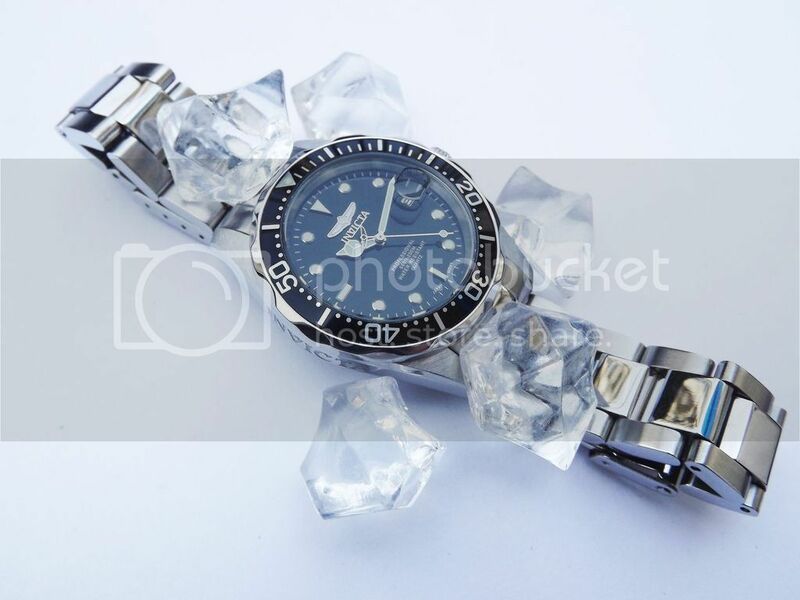 Its band is a standard size, it is stainless steel as is the body of the watch. The face is black as is the unidirectional black bezel. It is a simple looking watch, no unnecessary gadgets, such as chronographs, but then at the same time, its simplicity doesn’t help persuade the watching eyes that it merits a high-end status. Could this therefore be its Achilles heel? Is being big and bold enough to make something look more than it is, I’m not sure it is. everyday watch. It has a presence, after all it dominates your wrist. It is certainly more understated than the 0072, where gold replaces silver. Compared to the Invicta Men’s 6620 , the black face is a great distinguishing feature and this is matched in the 89260B. Personal taste will dictate what you buy and wear but with the 8932, we have a watch that is very affordable, and therefore can form part of a larger collection of watchers. When buying a watch, you have to try it. Imagine if you didn’t and then found the 8932 to be too big, you cannot say you were not warned. The 8932 may be too big, or just spot on. Whatever you do please make sure that you hold the watch, wear the watch to see if your arm holds up. Never just guess, as although it isn’t expensive, if you cannot wear the watch then it is a waste of money. So do you want one? When are you going to wear it? If not this then what are you going to wear? There are many choices and solutions. Do you want to spend time, with this timepiece, the 8932? It is said to be luxury, but quite how I am not overly sure. Is it affordable, certainly, almost frighteningly so? It will be noticed, it would be difficult not too due to its size. However, unlike the 0072, it isn’t gold, so it will not catch the eye in the same way as this for instance. Many like the subtly of the 8932, it is certain less garish than the 0072, as silver always will be when compared to gold. But then again, will it get as noticed? There is no hidden mystery as in the 89260B, but that may only be a gimmick. If you only wear a watch for it to be noticed by everybody else, and for it to be complimented by everyone who sees it, then maybe the 8932 is too subtle for you. Get a shiny gold one with encrusted bezel and lots of whistles and other “tricks”. However if you want an affordable watch, that looks good, but not garish, one that tells the time well and does a little more besides, and you are not someone who is always at the centre of conversations, but would rather sit and watch others make fools of themselves, then the 8932 is a good starting point. Personally, I am silver, not gold, black not pink, a listener not a talker, so the 8932 fits my personality.